You’ve probably heard of “chestnuts roasting on an open fire," but when was the last time you’ve eaten a chestnut? In the U.S. people usually eat them around the holidays, if at all. But ask Michigan farmers and they’ll say chestnuts are flying off the shelves. Local ethnic communities are helping Michigan’s chestnut industry to boom. Brett Morgan of Riverbend Farms in South Haven planted his first chestnut tree 25 years ago. Morgan was excited, but he says his wife didn’t think it was such a good idea. "Who is going to buy these chestnuts?" At first, she was right. Sales weren’t going so well. Morgan says people would stop to look at the chestnuts, but then leave empty handed. “People just aren’t familiar with them,” says Morgan. But last year, everything changed for Morgan. It turns out there are lots of people interested in chestnuts. They just have to find them. “We were discovered by the Korean and Chinese community out of Chicago and so they came in here and bought every nut that we can produce,” Morgan says. Now Riverbend Farms ships hundreds of pounds of chestnuts to Chicago every fall. Morgan says they go quickly. He even had to turn a restaurant down last year because almost all of the farm’s chestnuts were gone. “We just can’t grow enough chestnuts for…to satisfy that market on our little farm. So we actually go out and know other farmers that can’t sell them, that don’t have a market, and we actually go out and pick them up on their farms and bring them back here,” he says. Michigan State University Professor Dennis Fulbright is leading a research group to help chestnut orchards in Michigan become more productive. He says some people only eat chestnuts once a year at Christmas. But they’re much more popular in Asian, European, and Middle Eastern communities that have prepared the food for centuries. Jei and Jenny Yoo host a Korean-American church group at the Seventh-Day Adventist Church on Nichols Road in Kalamazoo. They both emigrated from Korea in the ‘70s. Jei Yoo says chestnuts are nostalgic for him. “Stroll down to the street [in Korea] and then you can find some vendor roast or cook the chestnut and then we can enjoy it,” Jei recalls. 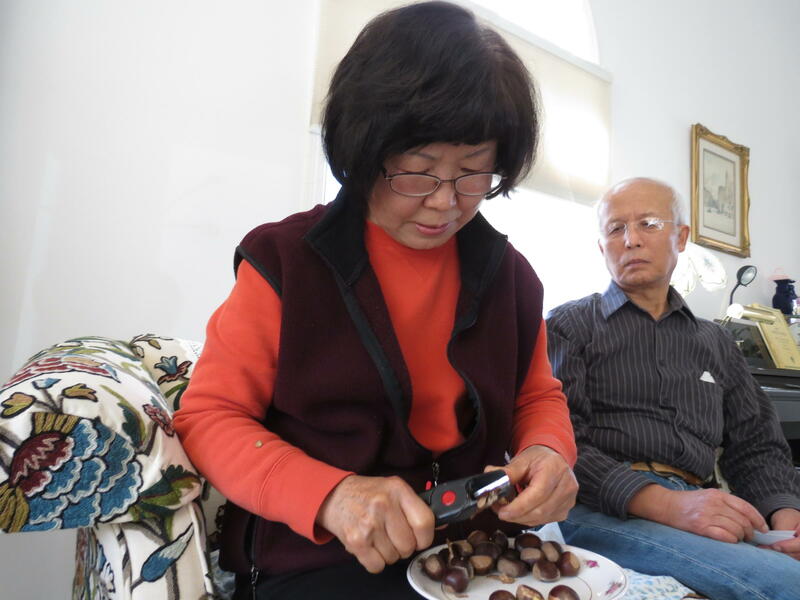 But Jenny Yoo says it took them about 20 years to start eating chestnuts again. She says the imported ones you find at U.S. stores are expensive, and not that good. “That taste is not that fresh or you know something different than you pick from farm,” she says. Dennis Fulbright says because they’re not refrigerated properly, most imported chestnuts are bitter by the time they reach the United States. So why does the U.S. import more than $20 million worth of chestnuts every year? Fulbright says that’s because the U.S. was in a chestnut drought. In 1904, a deadly fungus on imported Asian trees wiped out about four billion chestnut trees in the U.S. The only trees that survived were Chinese chestnuts and others that were resistant to the blight. “There wasn’t much of a choice for the longest time because there weren’t that many Chinese chestnut orchards that were established in the United States. But the ones that were established, given enough time - 30, 40, 50 years - those few chestnut orchards did produce well,” says Fulbright. MSU is currently growing a European and Japanese hybrid tree that’s also blight-resistant. Roger Blackwell is the president of Chestnut Growers Incorporated - a group of more than 30 chestnut producers in the state. He says U.S. chestnut farmers won’t be able to grow as many chestnuts as their foreign competitors for a long time, if ever. However, people are starting to notice the quality of chestnuts in Michigan - and more farmers are growing them as a result. Blackwell says in 2002, Chestnut Growers Inc sold only 2,000 pounds of chestnuts. Last year they sold 90,000 pounds. “And in 10 years we’ll be bringing probably close to 500,000 pounds of chestnuts to the marketplace. And I tell you right now, if I had a million pounds of chestnuts tomorrow - I got markets for all of them,” says Blackwell.Dennis Fulbright of MSU says he’s confident they can get even more people to start eating chestnuts. They just have to educate the public. “You have to know how to roast them properly. And a lot of people don’t take the time because they only do it once or it’s a subordinate part of their holiday - but a well-roasted chestnut is amazing," he says. You can find tons of other tutorials on how to prepare chestnuts on Youtube. Even though I grew up in a mid-size town, on Sunday afternoons my family often drove into the surrounding countryside, where we would buy a gallon of cider from a fruit stand, and then troll the back roads for hickory nut trees. Prices for organic produce are always a little higher. But lately you might have noticed you’re paying even more for berries. That’s partially because of a tiny fly called spotted wing drosophila. It’s a lot like an ordinary fruit fly, only it can lay its eggs inside a piece of fruit even before it starts to go bad.